For the 10th generation Civic, us North Americans will finally get the Civic Hatchback that the European market has had. It’s been over a decade since Honda last sold a Civic Hatchback this side of the pond. 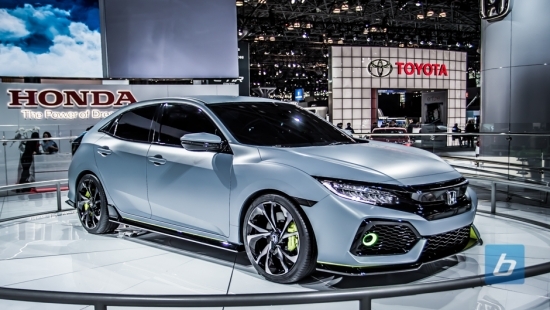 The Honda Civic Hatchback Prototype was shown off earlier this month in Geneva but it has finally arrived here in New York to make it’s North American debut. The prototype moniker is a bit of a misnomer as this looks pretty like a production ready Civic Si hatchback. When the Civic Hatchback launches later this year in North America, we’ll probably see a much more mundane base model as Honda slowly releases the other models culminating eventually with the Type R. The next generation Civic will feature a longer wheelbase and a wider stance compared to the model currently sold in Europe. Under the hood will be the turbo 1.5L 174 horsepower engine. The new Civic Hatchback, and the Coupe and Sedan for that matter, will also be available with a 6-speed manual transmission this fall. Details such as pricing are not available now but Honda says it will start to share more information as we draw closer to the fall launch. Honda also announced that they will be competing in the 2016 Red Bull Rallycross series with the Civic Coupe. We’ve included a couple shots of it as well in our gallery. They also brought the first us-spec Honda Clarity fuel cell vehicle to the show. Good news for those who have been eagerly anticipating any news on whether the Civic Type-R will be coming to Canada. We’ve posted about the progress of this vehicle a few times including the concept version we shot when we were at the Paris Motor Show which is pictured above. 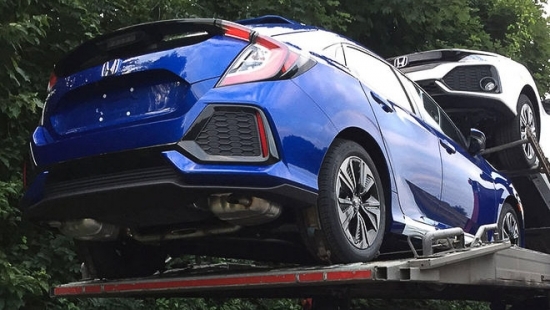 At the time, the Type-R was not expected to arrive in North America but at the New York Auto Show Honda showed off a “global model” leading to speculation that the hot hatch would be making the trip across the pond. 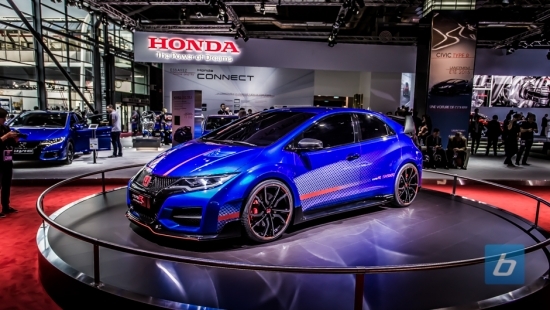 Today, sources have confirmed that Honda Canada has announced via its dealership network employee eBiz portal that the Type-R will indeed be arriving in Canadian dealerships. At this point, no pricing information or any other details are available but we’ll keep our eyes peeled for any official news from Honda Canada. If you forgot, the new Type-R redefines Civic performance by offering a more than 280hp in the Honda hot hatch. Coupled with a slick shifting 6 speed manual transmission and the ability to rev to 7000rpm, Honda promises the new Civic Type-R to exceed performance from the previous Type-R’s, which includes the Integra, Accord, and even the NSX. Many Honda fanboys were anticipating a Honda Civic Type-R unveiling today in New York but having covered many auto shows in the past, I knew not to have false hopes for vehicles especially when it comes to Honda. They were after all the company that first announced the HR-V by showing a picture of one on the screen and then followed up at the next show after that with Asimo and a motorized self balancing bar stool (haha, not really). Today, they actually brought a vehicle to unveil at their press conference and while it wasn’t the Civic Type-R it was still good news for Honda fans. 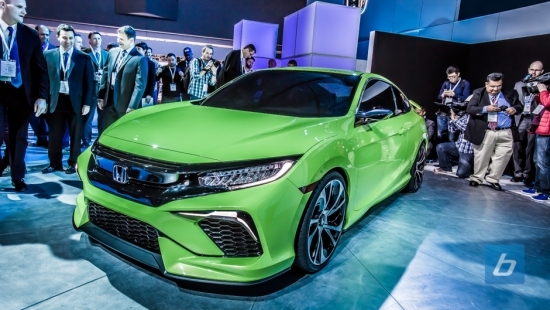 They revealed a new Civic Concept that previews what is to come from Honda for the 2016 model year. It had long been rumored that Honda would be expanding the market for the Civic that is available overseas. While Honda hasn’t confirmed that the “euro civic” is in fact coming to North America, they have confirmed that the Civic would now be exported to key markets around the world so we’re just going to assume that means the Civic will now be a global model and that the neutered North American Civic will be no longer. Honda is looking to boost production of their UK plant that churns out these Civic models and they won’t be able to do that without significantly expanding the market that these vehicles ship to. Many are also holding out on the possibility that this means the hot Type-R model will be available in North America. Now before you get all excited, what you see here is still just a concept of what the next generation Civic coupe will look like when it does arrive here. That means the aggressive front and rear bumpers will be gone. That flattened center exhaust? Gone. Wraparound LED taillights? Gone. The LED matrix headlights? Probably gone. How else will they differentiate the Acura ILX? All this will be moot because the only thing anyone and everyone cares about is that the Civic Type-R is coming to North America! The next year will be an interesting one for Honda fans as Honda is now back in the hot hatch game in North America joining the likes of the GLA, Focus RS, and Golf R. We took a ton of pictures so check out the gallery after the break. Just days ahead of the 2013 Tokyo Motor Show, Honda is showing off the 2015 Civic Type R development car at its in-house testing track in Japan. The Civic Type R, which Honda considers camouflaged, is being put through its paces as part of an extensive testing process taking place at its own testing facilities as well as the famed Nurburgring track ahead of its launch in 2015. 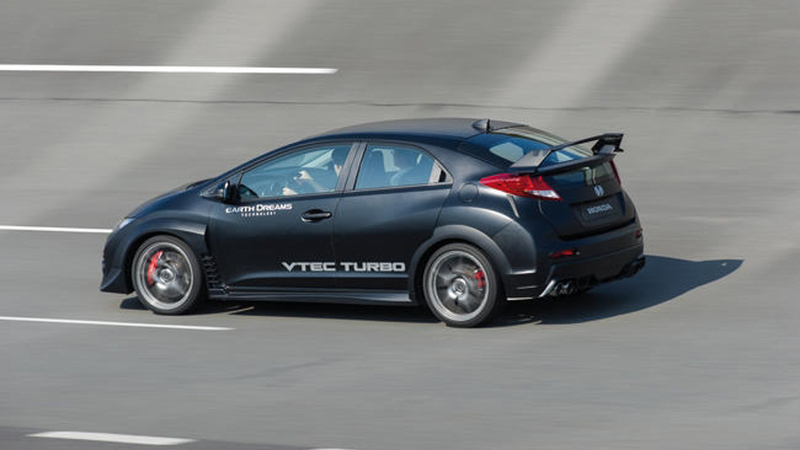 The Civic Type R will be powered by Honda’s first ever production turbo VTEC engine. The 2.0L 4-cylinder turbo engine will produce over 280 horsepower. It’ll be interesting to see how close to production trim this Honda Civic Type R is as it has a very aggressive front fascia and wide front fenders. Out back is a near double-decker wing. The front brakes stand out with the large flashy red calipers but it is difficult to say how big the rotors are but they’re at least 13″ up front. 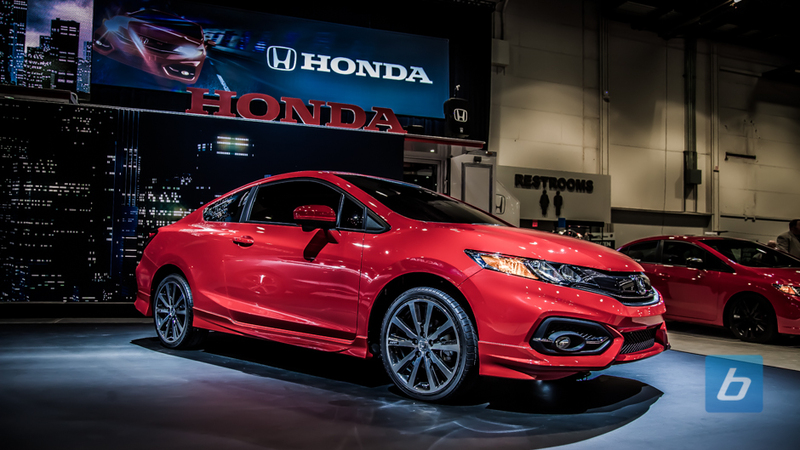 In addition to unveiling the all new 2014 Honda Civic Coupe, Honda had a lot to show off to the visitors of their booth at SEMA. Honda Performance Development (HPD), the racing arm of American Honda Motor Co. showed off its new range of HPD Street Performance products fitted to a couple vehicles in the booth. The Supercharged CR-Z pictured above features a near endless list of HPD parts including an air-to-air intercooler, high flow fuel injectors, air filters, sport exhaust, sport dampers, coilovers, enlarged brakes and 18″ wheels wrapped with Michelin Pilot Sport rubber. They also had an HPD Honda Civic with a full street graffiti themed wrap. Modifications included the following parts from the HPD parts bin: a big brake kit, performance springs, 25.4mm rear anti-roll bar, 18″ wheels and a K24Z7 racing engine. This is a preview of some potential new street performance accessories that may be trickling down to consumers developed from HPD racing experience. See: HPD Honda Civic Si Race Car and More in the Gallery! Honda unveiled a pair of new Civic Coupes in an early morning press conference that we missed because our media shuttle bus driver decided to take the worst route possible. We got to the booth just as the crowds were dwindling a bit and shot both of the cars you see here. The grey one pictured above is the new Civic Si Coupe which aside from the exterior updates receives a small (really small) bump in power up to 205 horsepower and 174 lb-ft of torque (up from 201 and 170 respectively). 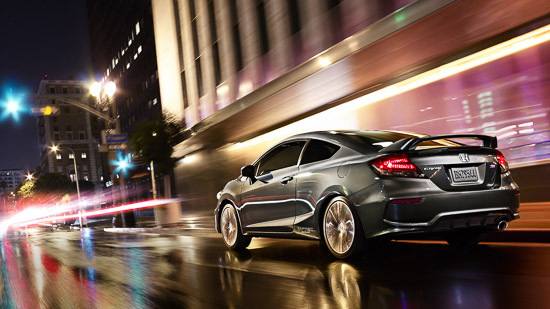 The Si model gets a larger rear wing and a set of new 18″ wheels which are available as an option on the Civic coupe. The red Civic Coupe gets much of the same design updates as its Si brother, but gets a more reserved rear spoiler. “With the further advancement of the 2014 Civic Coupe and Si models and an exciting path forward for performance parts drawing on our racing experience we are making a statement about our commitment to the fun to drive character of the Honda brand”, said John Mendel, executive vice president auto sales for American Honda Motor Co., Inc.
Honda also surprised performance enthusiasts by announcing plans to begin sales of street-oriented performance parts developed by Honda Performance Development, Inc. (HPD), Honda’s U.S.-based race engineering company, starting with a full range of performance accessories for the CR-Z sport hybrid coupe that go on-sale at Honda dealerships today. 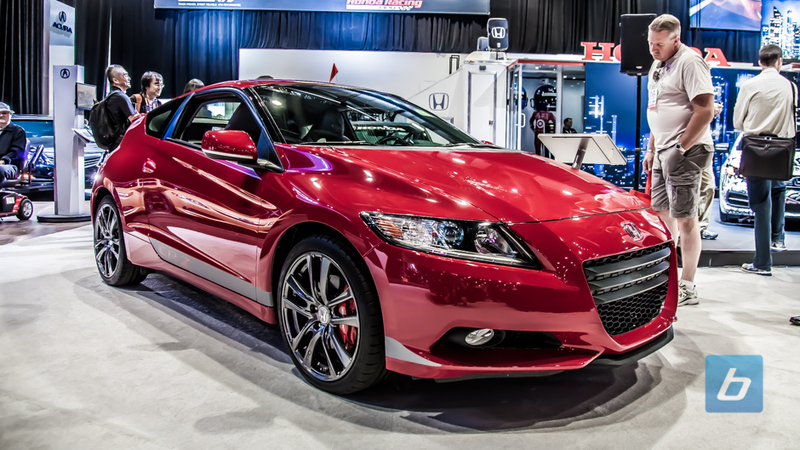 A power-boosting CR-Z supercharger package will follow in the spring of 2014. In the longer term, HPD engineers are also investigating other models and platforms in order to expand Honda’s street performance product line. Honda announced last week that it will be unveiling the 2014 Honda Civic Si Coupe at SEMA in Las Vegas. Above is the only shot of the car they have released. 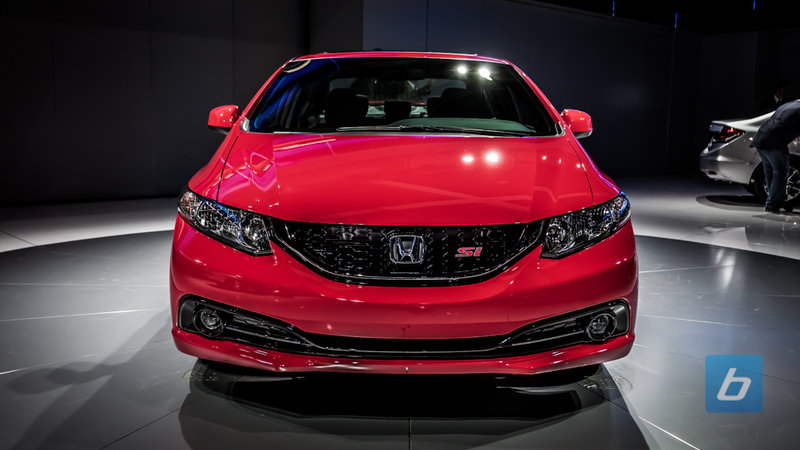 If it looks familiar, it’s because it incorporates many of the changes that were introduced to the Civic Sedan which were revealed at last year’s LA Auto Show. Similar looking smoked-lens taillights are present on the new 2014 Honda Civic Si, along with the same larger bolt on wing on top of the redesigned trunk lid. The rear bumper features a much sportier looking design with integrated diffuser. It’s hard to tell but Honda may have a new set of wheels to go along with the new coupe as well. We’ll find out more next Tuesday and will post up some pictures as soon as we can. Definitely not as cool as the animated promo that Mercedes did for the A-Class. 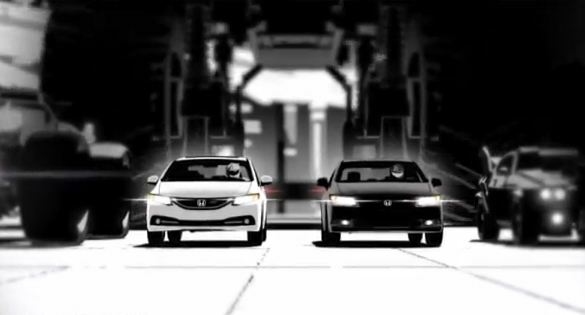 Actually, not even in the same league but still a pretty neat promo video that Honda did for the new Honda Civic Si. Honda is promoting the newly facelifted Civic, which as we remember was redesigned only after a single year on the market, by targeting the younger, hipper crowd. Is this the start of a whole new marketing campaign for the new Honda Civic? Looking forward to seeing what ads we’ll see from Honda for the Super Bowl and hopefully it has nothing to do with the NSX that we’ve all seen a bazillion times. standard features like rearview camera, bluetooth audio and handsfree, USB/iPod interface, and pandora interface.